The news of Johnny Walker Green Label being discontinued shouldn’t upset too many people but I think it’s a little sad to lose the only label in the JW line that I recommended people try. Where else can you get a blended scotch of high quality (all Malt, no grain) scotch? I’m sure there are several but I’m not a blend guy, mainly single malts. When you drink a dram of Green Label you are drinking Talisker, Linkwood, Craganmore, and Caol Ila products at once. Quite an affordable blend and unique experience. Efficiency and product trimming has evidently hit the JW line and the Green Label must be the weak link. If I had my way, I’d discontinue Blue….. So Diageo probably knows their market and this must seem like a good move on paper. They are evidently sponsoring a final “official” tasting that you can apply to be at on their Facebook page. The first time I ever bought the Green Label was a few years back while in St. Thomas. The costs were supposedly lower, not sure about that, so I bought a bottle there. I think it’s a very drinkable dram, nothing extremely special but a good everyday or with guests that you don’t want to pull out the “good” stuff for. For myself, it’s just a bit of nostalgia that the brand is going away, so I may stock up for no good reason but to have a “rare” product one day. If you are a regular Black label drinker and have not tried the Green, I would encourage you to try this one. Unlike your Black label, this one does not have any grain whisky in it. On top of that I’d say its finish is nicer and more complex. If you only drink Red label, please switch to Black!, and you too will notice a large difference in quality. Cheers to you Green Label! And Farewell! To be honest, I haven’t had the Green Label in quite some time, but I remember finding it very very drinkable. The best of the Red, Black, Gold section. The Blue is very nice, but I think ridiculously overpriced. I may have to stock up on some Green Label too! The whole blends vs. SIngle Malts debate is an interesting one. For the longest time, I was a Single Malt snob to a degree, but then I started trying some Compass Box and other blends and have learned to appreciate them more. Have you tried any of the Japanese blends such as the Hibiki 12 or perhaps some Nikka? They are really interesting and quite excellent. And then there’s some of the Irish blends. Would be curious to hear your thoughts. Yes, I have tried the compass box blends and the Hibiki products are quite nice also. I’ve even tried the Amrut offerings from India and they are good also. I think it all depends on your own palate really. I tend to favor a single cask offering specifically, it may be part mental but I think it’s just being able to focus on what was happening between that spirit and wood for so long. As much as I like The Dalmore which is a blend of single malts, I had a sample of a single cask, oak only, that I fell in love with! I think it was 14 years aged. Now Irish blends I look at very differently. Blending seems to rule the day with Irish whisky. What the Irish do so well is the extra distilling which smoothes out he spirit but I think sort of takes out the potential flavor. I’m one of the disappointed. 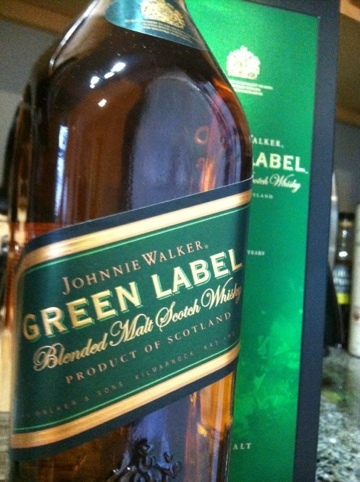 Green Label was big and smokey, yet also fresh and clean (especially in its later blends – my imagination?). It had two strikes against it in the market, though: 1) it was a vatted malt, which people think of as somehow inferior, and 2) it ended up lightly peated, a style international markets don’t seek out. What’s bad is that I can’t get Bunnahabhain here in my city, which leaves me without a natural go-to for the lightly peated scotch. Woe. At least I picked up the last bottle at our downtown retailer. I bought 6 bottles when I heard. By far the most underrated and fairly priced JW blend. Curiously I have never found it smokey at all, but I’m a bit of a late-commer, so may be I missed those editions (?). I’m glad you stocked up! I get several people a day come to my site curious about JW Green. It’s a shame it will be discontinued. I had a flask of green label, a friend found it at costco for a reasonable price. It’s still prominent in my market, not sure how much stock they had. I keep hearing that this is going away as well. However, the local distributor seams to always have a fresh supply. JW still has it listed as one of their main expressions on their website. Who knows?? I think many share your pain. Are you interested in their new products at all? Hi, Im looking for Johnnie green, who is your local distributor ? If there are any big fans of Green Label out there that are looking for a bottle let me know. As soon as I heard the rumor of it being discontinued I stocked up quite a bit. I have a few bottles I would consider letting go of. Hi, Id definitely be interested in picking some up.